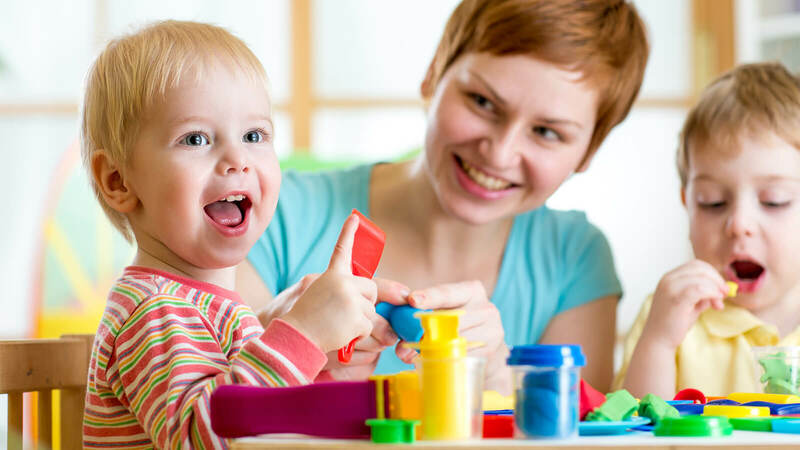 Click on the categories below to learn about what you should look for and ask when you visit a Child Care Center. Want to take a checklist with you on the tour? Click below to download a copy that you can print or fill out on your phone! Does the program provide safe and reliable transportation? If so, are drivers licensed and insured? Are children properly restrained in the appropriate car safety seat that is appropriate for their weight and age? Are there clear check-in and check-out procedures? Does the child care program have records proving that the other children enrolled are up-to-date on all of the required immunizations? Is hand-washing a regular part of the program’s practices for both staff and children, especially before eating and after using the bathroom? If the program serves food, does it meet nutritional standards? How does the program handle if a child has food allergies or dietary restrictions? *Eco-healthy tip: If the child care program is housed in an older building, it may still have lead pipes or solder. Warm water is more likely to leach lead out of old pipes and puts children at higher risk for lead poisoning. Ask if the program uses only cold water for drinking, cooking, and mixing infant formula. Are infants fed on demand? Is breast milk stored appropriately? Is there a place where mothers can comfortably breastfeed their child? How are new foods introduced to toddlers? Is the place where diapers are changed clean? Do caregivers always keep a hand on the child while diapering? Do caregivers remove the soiled diaper without dirtying any surface not already in contact with stool or urine? Do caregivers clean and sanitize the surface after finishing the changing process? Hands should be scrubbed with soap and warm running water for at least 20 seconds and then rinsed and dried. The water faucet should be turned off with a paper towel. How many children are cared for in the classroom? How many caregivers are in the classroom? Does the center follow best practices regarding ratio and group size? Or, does the center follow the state licensing standards for ratio and group size? Are children supervised at all times, both indoors and outdoors, even when they are sleeping? Can caregivers be seen by others at all times so that a child is never alone with one caregiver? Have all caregivers undergone comprehensive background checks? Have the caregivers been trained on how to prevent, recognize, and report signs of child abuse? Are all infants put to sleep on their backs? Do the infant sleep spaces consist of a firm sleep surface, such as a mattress in a crib, covered by a fitted sheet with no other bedding? Are the infant sleep spaces kept free of soft objects, toys, crib bumpers, and loose bedding? Are all child care staff, volunteers, and substitutes trained on safe sleep practices to reduce the risk of Sudden Infant Death Syndrome (SIDS)? Do all infants have their own designated sleep space that is the same every day? During rest time, can staff see and hear infants and toddlers at all times? Do caregivers regularly check on infants and toddlers when they are sleeping? Are safe sleep infant practices posted in the infant sleeping area as a reminder to all staff, volunteers, and substitutes? If infants can roll over, is there a sign posted by their bed indicating that the child can roll? What measures are taken to prevent babies’ second- and third-hand smoke exposure? Any smoke exposure can increase the risk of SIDS. Are indoor and outdoor environments clear of broken equipment, chipped or peeling paint and tripping hazards? Have the building and property been inspected for radon, lead and asbestos? If these hazards are present, how does the program minimize children’s risk of exposure? Are cleaning supplies and other chemicals locked away and out of reach of children? Are toys clean, safe, and within reach of children? Is smoking prohibited indoors and outdoors, including vaping, during work hours? If the program allows providers to take smoke breaks during the day, what measures do they take to prevent second- and third-hand smoke exposure? Are caregivers trained in infant CPR and is their certification current? Are infants and toddlers within sight and sound at all times? Does the program have a plan in place in case of a disaster, like a fire, tornado, flood, blizzard, earthquake or active shooter? Does the program practice drills once every month? Does the program have an emergency plan in case a child is injured, sick, or lost? Does the child care program have information about who to contact in an emergency? Have caregivers been trained on CPR and First Aid, and are those certifications current? Does the program have first aid kits? Are medications kept out of the reach of children? Are the caregivers trained on medication administration, and are medications labeled to make sure the right child receives the right amount of medication? Is there enough room in the environment for children and providers to move around? Are there different areas for resting, quiet play, and active play? Is the environment clean? What measures have been taken to keep outside contaminants from coming into the classrooms? Are there enough toys and learning materials for the number of children? Do the classroom materials change based on what children are interested in? Does the program use TV, computers, or other types of technology with the children? If so, how often are these materials used? *Eco-healthy tip: Does the program use fragrance-free, non-aerosol cleaning products? Aerosol sprays can trigger allergies and asthma attacks. Some fragrances that are added to detergents and all-purpose cleaners can be harmful. Is there a space for outdoor play? Is the outdoor play area fenced in? Is the outdoor play area regularly inspected? Is the outdoor area clean? Is the equipment the right size and type for the age of children who use it? Are children taken outside on a regular basis? Do caregivers actively supervise (play with) children outdoors? *Eco-healthy tip: Does the program encourage families to turn off their vehicles in the parking lot? Exhaust from idling vehicles can cause poor outdoor and indoor air quality that makes breathing difficult for kids and adults with asthma or other chronic breathing problems. *Eco-healthy tip: Is the building located near any busy roads, gas stations or factories? If so, what is the program doing to minimize children’s exposure to air and water pollution? Chemicals from farms, roads and other businesses can pollute the air and water of nearby properties. Are children comforted when needed? Do caregivers and children enjoy being together? Are children warmly greeted when they arrive? Do caregivers talk to children and seem genuinely interested in what the children are doing? Do caregivers get down on children’s level and speak with them? How do caregivers help children solve their own problems? How do caregivers react to children’s behavior? How do caregivers encourage peer interactions? Is there a daily balance of play time, story time, activity time, and nap time? Do children play for a significant part of their day? Do children get to choose who they want to play with? Do caregivers play with children to help facilitate their learning? Do caregivers share and talk to parents about their child’s daily activities, either at drop-off or pick-up? Does the program incorporate technology as a communication tool? If so, is information shared with parents on how to access it and how the information is kept secured? Are parents encouraged to visit at any time? Are there ways for parents to be involved in the program? How are parent ideas incorporated into the program? Are there regular opportunities (at least twice per year) where parents can meet with the staff and share their child’s strengths and hear how their child is developing skills? How often do caregivers share observations and ongoing assessment information with parents? How do caregivers work with parents to incorporate the family’s culture and values into the classroom? How are transitions from classroom to classroom handled? What type of support does the program offer to both the parents and the child during this time? Does the lead caregiver/teacher have a bachelor’s degree in a child-related field? Has the teacher worked in child care for at least one year? Does the teacher plan lessons and experiences for the children that help them learn and grow? Does the director have a bachelor’s degree in a child-related field? Has the director worked in child care for at least two years? Does the director understand what children need to learn and grow? Are the caregivers/teachers and director involved in ongoing training or continuing education programs? Does the program provide a written contract before you enroll your child? Does the program provide a copy of the parent handbook prior to enrollment? Does the program clearly outline the cost of care, field trip or special program fees, and any other fees? Does the program have a policy regarding drop-off and pick-up times, including who can pick up your child? Are there fees for late pick-up? Does the program have a policy for times when it may close, such as for certain holidays, inclement weather, or in case of emergencies? Does the program have a policy regarding when your child and other children should stay home because of illness? Does the program have a policy regarding termination of your child care agreement? Does the program have a written policy for when the provider is allowed to give medications? Does the program have a written supervision policy or plan that ensures children are supervised at all times? Does the program provide a written guidance and discipline policy? Does the program follow a certain teaching philosophy or use a curriculum?